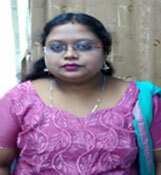 Mrs. Indrani Nag Chaudhury, Assistant Professor in Economics obtained her B.Sc. (Hons. ), M.Sc. and M.Phil. from Calcutta University. She has served Presidency College from 2009 to 2014. Her Research areas are Micro Economics and Econometrics.